Often referred to as Wall Ties or Cavity Ties, Masonry Restraints are used to provide structural stability to masonry wall panels and to transmit forces imposed by wind pressures. This range of restraints includes cavity ties, frame cramps, brick ties channels, head restraints, and sliding brick anchors. In addition to the standard ranges, products, such as Ancon Wall Ties are also manufactured to special requirements. Masonry restraints are fixed back to the structural frame by various fixing methods depending on whether the frame is steel or concrete. 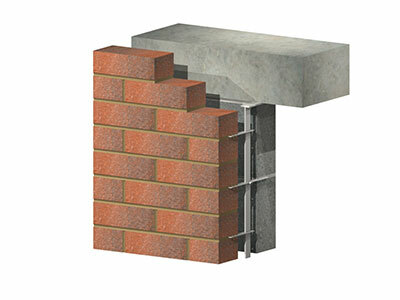 Frame Cramps are ties required in brickwork & masonry to provide structural stability and to resist the wind load. They allow masonry wall panels to be restrained back to other elements of a structure. This could be to pre-built walls, or new or pre-erected steel frame work. The wall ties, once in position, prevent sideways movement between a masonry wall and another structure. Restraint ties come in various lengths ranging from 75mm to 250mm. 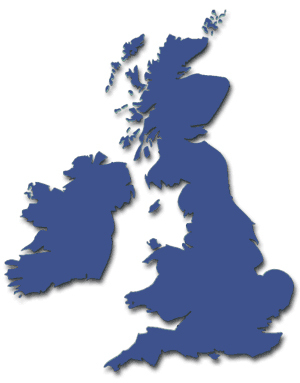 Other sizes are non standard and therefore have to be specially manufactured. Frame Cramps fixed for use as cavity masonry ties must have the water drip feature for dispersing moisture build up in the cavity. Frame Cramps used for vertically restraining the masonry panel at stansion points can either be used with a mortar joint or a movement joint. Frame cramps used at a movement joint must be fitted with a debond sleeve. Head restraints are generally used to restrain the tops of free-standing brick walls by tying them securely to an overhead frame, so preventing sideways movement. There are 3 main types of head restraints, they are the internal fix head restraint, the face fix head restraint and the sliding anchor head restraint. 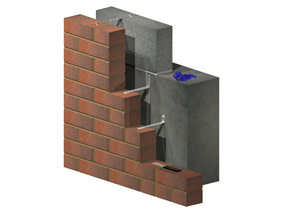 The internally fixed head restraints are used to restrain the inner leaf of a cavity wall. The head is designed with a 7mm or 10mm hole for fixing to either the under side of steel frame work or concrete and allows differential movement between inner leaf and the structure. The foot of the head restraint is bent to allow it to anchor under the blockwork. 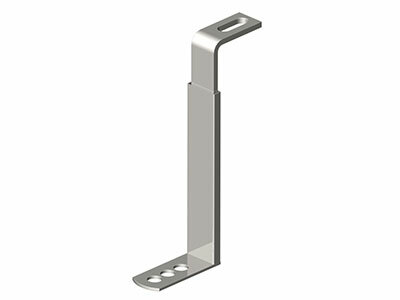 This head restraint can restrain 100mm and 140mm blockwork. The face fixed Head Restraint is used to restrain the head of internal walls or the internal leaf of a cavity wall. Two angles are clamped together over the block at the top of the masonry wall and then bolted to the underside of the structure. This restraint is designed to clamp around a 100mm, 140mm and 215mm block. These head restraints support a maximum horizontal line load of 1.0kN. This Sliding Anchor is used in conjunction with single and double skin ties, to tie the inner and outer leaf to structural steelwork or concrete where a movement joint is required. They provide lateral restraint while allowing vertical movement. The sliding anchor is positioned within the cavity and fixed through two 7mm or 10mm holes to the underside of the structure, and sliding ties are positioned to suit the wall coursing. This sliding anchor is designed to service a maximum load of 1.5kN. Generally bricklayers / labourers fix stainless steel wall ties as the brickwork progresses. This not only stops the bricklayer laying bricks but as they are not structural engineers can result in various problems. It is fairly common that these masonry ties are fitted at the incorrect centres or not fitted at all. It is also common to find the incorrect size or specified wall tie being installed. This can result in the masonry bricks bowing and cracking which inevitably results in the brick wall having to be rebuilt. Vision installers are trained and experienced in the fixing of masonry fixings, we offer time served operatives that are able to overcome any wall ties fitting issues. Our restraint fixers will fit up to 300 wall ties per man per day depending on specification, this not only allows bricklayers to be more productive but also speeds up tight site programmes which is essential in modern day construction. With Vision fitting your restraint ties you are guaranteed they are fitted to specification with the correct fixings. They will be fitted on the correct line, to gauge (gauge tape fitted as standard) and fixed in the correct location. All ties and head restraints will be correctly isolated where necessary. Using Vision, considerably more ties will be fitted on a daily basis and a QA sign off sheet for each floor fitted will be provided weekly which gives you a holding point with clerk of the works. Your masonry restraint ties will be fitted once fitted right. We have subcontracted Vision Ltd to install brickwork support angles. They are providing an efficient and professional service with competitive rates. I would not hesitate in using Vision again on future projects.